So, first things first, this is Max. He's 13 days old today and he will be coming home with us in October. He opened his eyes to have a little peek at us, then promptly scrambled off to have his lunch. He's tiny and a bit wrinkly and very, very lovely. This is really the most important news you need to know; the rest is just backstory, but do feel free to stick around if you're curious. When Jasper died, a surprising number of people asked if we would get a new dog. Dog owners, non-dog owners, dog haters, dog lovers, didn't matter - dozens of people asked us this question right after he died. At the time, I said no, definitely not. I am not putting myself through that heartbreak again. It was horrible and I didn't want to experience that kind of loss a second time. As time went by, I still didn't want another dog (and my stomach sank when Paul said he definitely wanted another) but I hated not having a dog. Jasper left a huge hole in our lives, crumbs on our floor, and the absence of toenail tapping on our floors. As we got to the six month mark, I started to feel like the time was right to get another dog. I had a look at the Kennel Club site for local breeders, and thought to go back to the breeders who gave us Jasper - but then somehow this seemed wrong. It's totally irrational, but I didn't like the idea of getting a dog that may be genetically linked to Jasper; it would feel like we were trying to replace him or that we would expect this dog to be the same. There was also the nagging worry that Jasper's cancer may have been hereditary, so getting another dog from the same line may have some risk. I had a long look at the KC site and narrowed it down to a few breeders, but one in particular caught my eye. They're called Copperwheat Labradors and they had quite a few accolades from the KC. I got in touch with them and they arranged for us to visit in a couple of weeks. A colleague of mine was showing off photos of her new puppy at work the other day, which just happened to be a Copperwheat Lab. She said she spotted some handsome Labs at a horse event and asked where they got their dogs from, and they recommended Copperwheat. I took this to be a good sign and we looked forward to our visit. 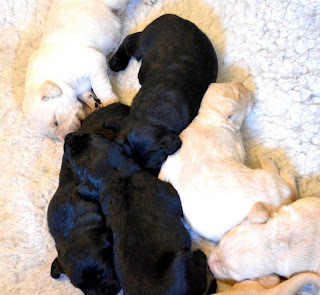 When I spoke to Ken from Copperwheat, he said he didn't have any black boys available with their current litter (our preference), but invited us to come and see the pups and have a chat about what they do. He said they do have several litters a year, so I just assumed we'd have to wait for the next one - which is fine, seeing as we're in RenoHell at the moment. We took Jack and Mia with us, only telling them in the car where we were going (they weren't that excited about it, to be honest.) Ken turned out to be a lovely, friendly man who is clearly enthusiastic about his dogs and training dogs for field trials. He talked us through the process of getting a dog, asked us about our experience with dogs, and we had a long talk about their health checks, hip scores, and lots of other things that will bore the socks off anyone who isn't a dog person. Then the fun began: we met the puppies. It took huge amounts of restraint to not run off with all the puppies in my handbag. They were so small and sweet, curled up around each other. It ends up that one boy did end up becoming available and as Ken held him aloft, he said "This would be your dog!" Their mother greeted us gently, calmly, affectionately giving us her head for a pat. Ken's dogs are all so chilled, it's amazing. We're used to Jasper's lead-lined tail and the way he barrelled out of the house (and up the stairs and through the house), it was so strange to be greeted by a dog that simply wags its tail and gives you a little nuzzle. Ken then brought out several of his dogs, all different personalities, all ages, and various levels of training. They were all astoundingly well-behaved and beautiful. It may sound strange (or shallow) to keep going on about good behaviour, but a docile and intelligent dog that is highly trainable is ideal, especially for a family pet. Copperwheat also provide information on training, house training (very important! ), and ask you to come back with the dog after a few months if you would like advice or just to let them know how you're getting on. It really felt like Ken ran the Rolls Royce of dog breeders. We were so impressed. So needless to say, it took us about 2 seconds of deliberation to confirm that we would very much like that boy we saw at the beginning. By this point, the kids were markedly more excited. We left feeling excited and happy, me feeling a bit emotional. We never saw Jasper as a very young pup as we got him at 11 weeks old. 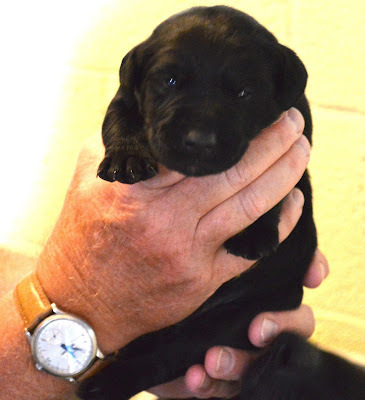 We will see this pup again at 4 weeks, then we'll take him home at 8. I realised that this pup was born almost exactly 10 years after Jasper arrived in our home. Everything just seemed to fall into place. I know that this dog will break our hearts again one day, but the alternative of never having another dog in this house was equally heartbreaking. I also know that this dog is not Jasper, and will have a personality all of his own. And suddenly all the mess and the chaos and the stress of renovating seems a lot more bearable.